Here I have, well, actually four new (to me!) vintage items, but then the title wouldn't really work. I finished my first week of 'work experience' today, having spent five days working with a fantastic small company who recycle, customise and remake old clothes to create beautiful new pieces. It was both inspiring and informative to be working with the two lovely women who run the company, and I've learnt quite a few new creative skills! As it was my last day in this placement today, I got to customise one of my own pieces of clothing, which I'll hopefully feature when it's finished.. Anyway, one of the vital parts of the week's activities was, of course, a visit to a vintage shop! (For, erm, marketing purposes and to research stock.) And while there, how could I resist buying this gorgeous little quilted number - I'm assuming it's a fifties house coat? And even better, it was one of the cheapest items in there at only £18! I nearly always say this about so many things I feature, but I love this print! 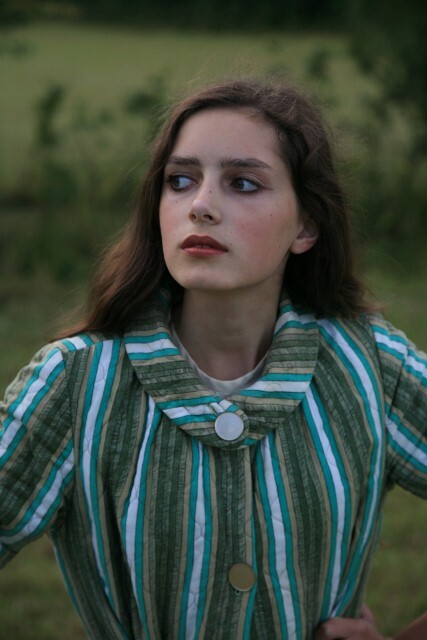 The vertical stripes in soft shades of green and cream are just my cup of tea. So that was the first of the two 'tales'. Part two is my dress, fom that old favourite Beyond Retro. As I walked in, I idly said "I really want a cream shift dress, but it has to be perfect. I'll know it when I see it." And lo and behold, I laid eyes on it literally 30 seconds later! It has this fantastic meandering overlay stitched on top of the lace, and a beautiful airy skirt. Unfortunately it is partially see-through, but I had a trusty underskirt to hand! And then there's the brogues, ah the brogues! Admittedly they are a size and a half too small, but I couldn't just leave them languishing in a charity shop! (They were bought after a LAMDA drama exam last week.) Not only are they never-been-worn Doc Martens (! ), they are also vintage as my mum recognized the store from the label, and it no longer exists. So, they will only be appearing for shoot purposes, but I think they were definitely worth £6! The bag was acquired at a local vintage fair, and is everything I could want from a bag. A boxy shape, large enough to hold my camera, beautiful buckles and the nicest brown leather! (Which is the only colour to have leather bags daahling.) I was one happy lady after that purchase! Even the stallholder admitted she'd find it hard to let it go. And the little gold necklace is from another charity shop while the hat is one of a rather large collection I inherited from my great-grandma. The belt was my paternal grandma's in the seventies, and my bracelet is a vintage necklace of my mum's that I wound around my wrist a few times. So its an absolutely all vintage outfit! Many different eras, designs, colours, places of origin and locations where they were bought, but somehow they've all ended up together in this ensemble! That's the complete beauty of vintage, all these diverse pieces with backstories and previous lives inhabiting my wardrobe. Did a fifties housewife originally own my coat, or is there some story behind the immaculate brogues that no-one wore for years? My dad took the photos at the top of a hill way up behind my house. (Same location as a two-part post last autumn - Greenery scenery, also involving similarly shaded clothes!) It was a surprisingly cold early evening, so I'm glad I had that coat. In light of my previous musings about keeping the brogues even though they're too small for me, do you have any clothes or other items that you hang on to even though they don't fit/ have no purpose any more? I certainly know that my brown seventies boots that I styled Emma in are another classic example for me! I am traveling to my friend's tomorrow for the next week of work experience, so I might end up being even more unresponsive with my blog! Apologies in advance if this is the case, but I'll look forward to catching up when I get back! 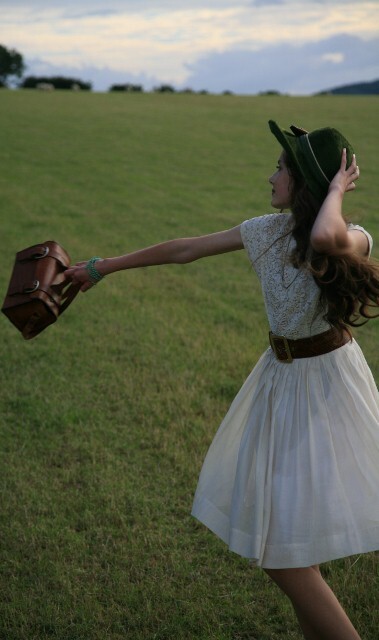 Il est magnifique ce shoot , c'est naturel, beau , j'aime beaucoup ce petit sac et ce chapeau-warw! This is such a beautiful photoshoot. The one of you on the tree roots, three from the bottom is my favourite, the lighting is perfect! Thanks for brightening up a dull Saturday. Your work experience sounds delightful,I wish I could say the same for my own! The brogues,bag and lacy dress are dream pieces and are making me incredibly envious! I don't understand how you can so easily acquire all these pieces,at such great prices!? I just never seem to find anything so beautiful.I think I need some tips! I am right now scroling back up the page and glaring at that little bag....oh,it really it so nice! The photos and outfits in your posts are always stunning, really gorgeous. These are all lovely photos! The new job you have sounds so fantastic. This is a truly stunning post! The colors are rich and deep, the lighting is magic and you are enchanting. Great styling! Tell your dad these pics are spectacular! The best part about the shoes is that one day if you choose to open an online store or Etsy shop, you can always sell them! love your blog. you have such an amazing eye for fashion and photography. PS - I need to travel just to go shopping at that shop! Ahhhhhh, I LOVE that fourth photo of you, it is amazing and you look amazing. Love, love, love! I would buy that as a print. You look amazing, straight out of history! the cream dress is so gorgeous! as are the brogues & leather purse. what wonderful vintage pieces! those shoes are wonderful definitely make the outfit for me! Your work experience sounds amazing! I did mine at a magistraites court which was really interesting to listen to the cases, but afternoons of filing was seriouly dull. My second week was at a travel agent where they made me sit on a chair in the corner and 'observe' I wasn't allowed to talk to any one, or even tidy brochures. Needless to say I was 'ill' for the rest of the week! I dont have anything that doesn't fit but I do have a few things I use for the blog and then ebay as I wouldn't wear them etc. I am not much of a horder and have my wardrobe on a constant recycle. Wow, the photos are so amazing as always and I really do love the coat and your shoes!!! i want to buy one like this..
open and blatent hint: I am a woman's size 7, a 5 in unisex Doc's and I love those brogues. Perhaps if they are MY size we could come to an agreement. A clothing swap, perhaps? Hmmm? This series is one of my all time favorites of your endeavors. LOVE it. Love the clothing, the shots, the mood. if it were in a magazine, it'd already be yank out and taped to my refrigerator. LOVELY. Brogues. size 7? talk to me, chica. love it. i really like the jacket. I just went vintage shopping myself, but I'm new to it. How'd you get interested? Your images are absolutely astounding! I can't tell you how refreshing it is to stumble upon a style blogger who isn't influenced by anything other then her own personal style and vintage. Really exciting to see! gorgeous photos! i love the dress, it fits you perfectly. How lucky to find all these pieces, the bag especially! They work so beautifully together as an outfit too Roz. I have the worst habit of buying secondhand or vintage stuff that is too big, small or in an unflattering cut. I just kept it to look at basically. Also sometimes I buy dresses that I could never wear just because they are so beautiful that if I can't have them, I want to see them looking pretty on someone else so the dresses just wait in my wardrobe until I find someone. I LOVE these photos, especially the fourth shot! I have been almost religiously checking your blog for a few months now, and finally had the nerve to start my own! While mine is not about fashion (at least not yet), you definitely inspired me. You have a beautiful blog! love this outfit, you are so brave and creative. i would never have thought to buy a quilted house coat but you style it so well! love the shoes and bag so much! hey thanks for the lovley comment, i hadnt seen it, and yes OF COURSE ive heard of adam and the ants, i really love 80s music but i cant list it all, it would take me years! and its really great you have some common music intrests, sixouise and the banashees is also rad, and the clash, blondie is soo good to, debbie harry will always be a fashion inspiration to me, by the way, lovley pictures, you are beautiful! You blog continues to impress me and.. well awe me every time I visit it! It is so wonderful. Your fashion sense and photography are really great! Keep it up! the house coat thing is the highlight of your outfit! really nice to see you mix up vintage and make it work. you're very creative w/ your wardrobe, and find the most incredible pieces!